Chicken recipes are one of the most widely searched on the web, particularly at 4pm according to recipe site Allrecipes.com. In the late afternoon nearly 10% of their recipe searches are for chicken, compared to about 6 percent the rest of the day. So even though this is our fourth chicken post recently, I thought another recipe may be welcome. Since I’ve been reviewing the plethora of recipes I read in magazines, here’s another favorite. 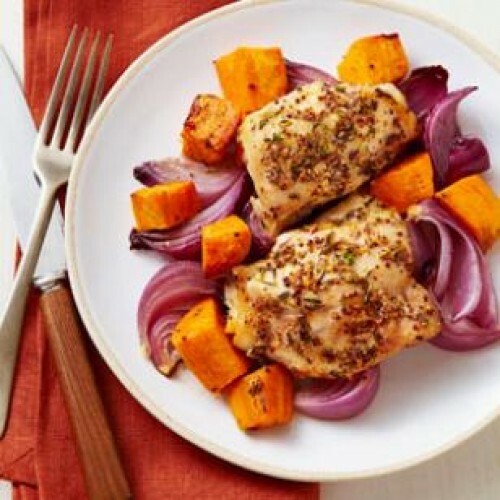 Roast Chicken and Sweet Potatoes from the September issue of Eating Well Magazine bakes in just 35 minutes, with less than 15 minutes prep. I made it a one-pan meal by adding green beans half-way through the bake time. I’d just received beautiful beans in my weekly CSA box, but broccoli or bell peppers could be added for extra veggies. I loved how the red onion caramelized with the sweet potatoes, and the mustard-thyme coating on the chicken was super flavorful. Just mustard, thyme, olive oil and S&P, it couldn’t be easier. I used jewel yams which are actually sweet potatoes but labeled as yams. (Yams are a quite different starchy tubor native to Africa and Asia.) If you use sweet potatoes, expect them to be a soft yellow-white, drier and not usually as sweet as yams. 1.Position rack in lower third of oven; preheat to 450°F. Place a large rimmed baking sheet in the oven to preheat. 2.Combine mustard, thyme, 1 tablespoon oil and 1/4 teaspoon each salt and pepper in a small bowl; spread the mixture evenly on chicken. 3.Toss sweet potatoes and onion in a bowl with the remaining 1 tablespoon oil and 1/4 teaspoon each salt and pepper. 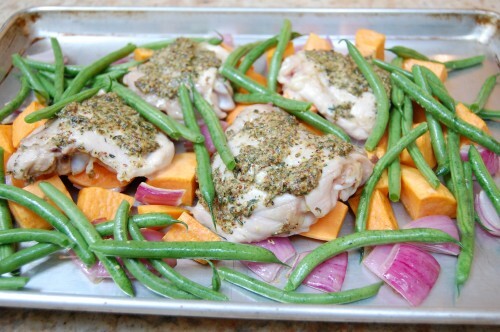 Carefully remove the baking sheet from the oven and spread the vegetables on it. Place the chicken on top of the vegetables. 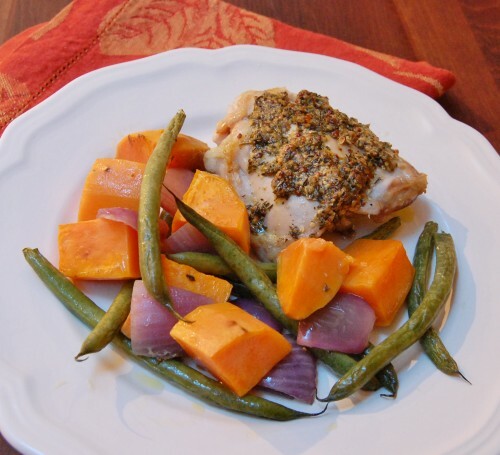 4.Return the pan to the oven and roast, stirring the vegetables once halfway through, (add green beans or other vegetables at this point)until the vegetables are tender and beginning to brown and an instant-read thermometer inserted into a chicken thigh registers 165°F, 30 to 35 minutes. Nutrition: Per serving: 408 calories; 17 g fat ( 4 g sat , 9 g mono ); 86 mg cholesterol; 34 g carbohydrates; 0 g added sugars; 27 g protein; 5 g fiber; 554 mg sodium; 636 mg potassium. GOOD! I heve cooked similar mix to this and sometimes sub pork chop for chicken. You can never run out of ideas for either. Agree, this would be terrific with pork chops! Thanks for the idea. Ѕaved as a favorite, Ι really like youг websitе!